Enjoy a perfect day in Dubai with hop-on, hop-off access to three different bus routes. Learn about the emirate's vast history and rich culture with the help of pre-recorded commentary available in 12 languages onboard the comfortable, air-conditioned double-decker buses. Explore Dubai in the comfort of an air-conditioned, double-decker bus on this 1-day Hop-On, Hop-Off bus tour that allows you to hop on and off at your own convenience. Learn about this famous emirate through pre-recorded commentary in 12 languages onboard the bus. The tour has 3 well-planned routes and over 30 stops that enables you to explore the city of Dubai on the Red Route, drive past the beachfront and Atlantis the Palm on the Green Route, and explore the Dubai Marina on the Blue Route. The buses run at a 20-minute frequency allowing you can hop on or off at any of the stops at any point of the tour. A free Dhow Cruise, night tour, guided walking tours of the city, and free entry to 7 museums are included in the price of your Hop-On, Hop-Off ticket, allowing you to experience Dubai to the fullest. Go around the city of Dubai in bright red Hop-On Hop-Off double-decker buses with an open top, so you can discover the numerous sights of the city from your unique vantage point. With the Hop-On Hop-Off ticket, you can board and deboard the city sightseeing buses as many times as you'd like, at your own convenience. This gives you the flexibility to spend as much time as needed at each of the attractions. The buses cover three routes and have over 30 stops, including major attractions such as the Burj Khalifa, Palm Jumeirah, Dubai Mall and more. The buses run at a 20-minute frequency between 8:50 AM and 6.00 PM. You can plan your day and explore it at your own pace with ease. There will be a live, English-speaking tour guide on the Red Route, and pre-recorded commentary in 12 languages on the Green Route and Blue Route. You can view the detailed route by clicking here. In addition to the Hop-On, Hop-Off Tour, don't miss out on the free Dhow Cruise, free guided walking tours, free access to 7 Dubai Museums, and the night tour that are included in your ticket. 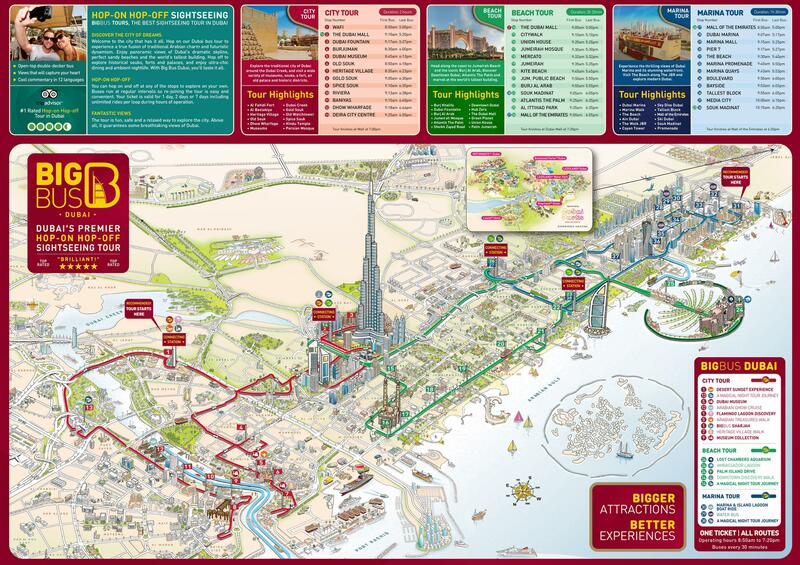 Your exploration of Dubai doesn't get any simpler than this! 1-Day Hop-On, Hop-Off tour in a double-decker, air-conditioned bus. Free entry to 7 museums (including Dubai Museum and Sheikh Saeed Al Maktoum's House). Live, English-speaking guides on the Red Route. Pre-recorded commentary in 12 languages on the Green and Blue Routes with complimentary headphones. One mobility impairment access seating per bus. 1-hour Dhow Cruise (Hourly, 10:30 AM-5:30 PM). Night tour (Every two hours, 6:00 PM -10:00 PM). The buses run at a 20-minute frequency between 8:50 AM and 6:00 PM. First tour from Stop 1 (The Dubai Mall): 8:50 AM. Last tour from Stop 1 (The Dubai Mall): 5:50 PM. You can hop off at Stop 1 to change to the Beach Tour (Green Route). First tour from Stop 12 (The Dubai Mall): 9:00 AM. Last tour from Stop 12 (The Dubai Mall): 6:00 PM. You can hop off at Stop 16 (Mall of the Emirates) to change to the Marina Tour (Blue Route), and Stop 12 (The Dubai Mall) to change to the City Tour (Red Route). First tour from Stop 17 (Mall of the Emirates): 9:00 AM. Last tour from Stop 17 (Mall of the Emirates): 6:00 PM. You can hop off at Stop 17 to change to the Beach Tour (Green Route). You will receive an email with your Classic Ticket - Big Bus 1 Day Hop-On-Hop-Off Bus Tour voucher shortly. You may display the voucher on your mobile device and present it to the driver directly on the bus. You may board at any stop within the 3 routes on the tour. Your mobile voucher is valid for six months from the date of purchase. Once you have redeemed your mobile voucher, it is valid for 1 day. Please note that your ticket will be valid within operating hours only.